1. 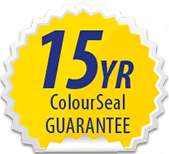 Never use any abrasive, acid, solvent, alcohol, petroleum based or high alkaline products on GroutPro ColourSeal. 2. Only GroutPro Pro-Kleen and Citrus Eco-Kleen pH neutral maintenance cleaners should be used on GroutPro ColourSeal. 3. Initial and ongoing maintenance cleaning must be carried out as detailed in the GroutPro ColourSeal Maintenance Procedure provided by the Franchisee. Prior to making a claim, the client must make all reasonable efforts to remove any staining using GroutPro Pro-Kleen and following the procedures as outlined in the GroutPro ColourSeal Maintenance Procedure. To make a claim, contact the GroutPro Specialist named on this guarantee and they will return to the original job location free of charge to inspect, and they will rectify any failed part of the original installation if it is deemed that the failure has been caused by a product or an application failure. If it is determined that there has been no product or application failure and the claim is therefore invalid, the inspection will be free of charge, however any further call out relating to the invalid claim will incur a call out fee. This determination will be at the discretion of the individual franchise business that performed the work. Rectification of the problem leading to the invalid claim will be charged at the discretion of the franchisee. This guarantee is non-transferable and is applicable only to the original client. Degradation caused by failure to follow the GroutPro ColourSeal Maintenance Procedure, mechanical abrasion, penetration, or other interference. Shower Bases, Wet Room floors, Exterior Application & any application area where there is likely to be water pooling or ColourSeal submersion can occur. * In areas where there is or could be a high instance of mould and mildew, your GroutPro specialist will treat the area prior to application of the ColourSeal to avoid future growth. The treatment is very effective on surfaces it contacts, however while efforts will be made, inaccessible surfaces can not be fully treated where contact can not be ensured, therefore your Specialist can not guarantee against re-growth and re-emergence of mould or mildew. All GroutPro Specialists are independent franchisees owning and operating their own businesses. This guarantee is provided by the franchise business that performed the work so responsibility for rectification on valid claims remains with the individual business. No liability will be accepted by GroutPro Australia Pty Ltd on any aspect of the Franchisee Guarantee. GroutPro Australia Pty Ltd provides a product warranty to the franchisee and will provide replacement product to the franchisee to support valid claims at its discretion.